The Luxaflex® wood collection consists of a large selection of FSCapproved wood. The wood used will vary depending upon your selection. We use Oak, Cedar, Ash, Walnut, Beech and Basswood. From a striking red piano finish to a beautiful grained oak wood the collection has something for everyone. If you are looking for the unique, then let Luxaflex® custom colour your wood blind, just choose the colour you’d like, and we can spray the blind to meet your design requirements. 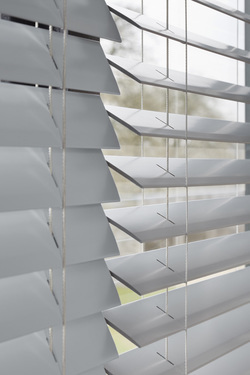 In the Fusion model, the wooden components of your blind are combined with beautiful, stylish aluminium accents which just have to be seen! 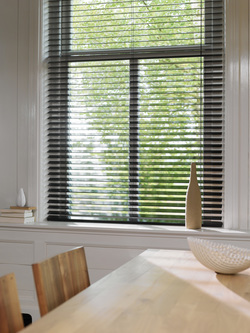 Your wooden blind takes on design radiance without losing the warm experience of natural wood. Let yourself be amazed by the combination of atmospheric wood and the radiance of aluminium – an absolute stunner! At Luxaflex® we are always asked for advice on wood blinds and bathrooms, so we can now offer the stunning faux wood collection. This PVC based fabric is ideal for any window near running water.